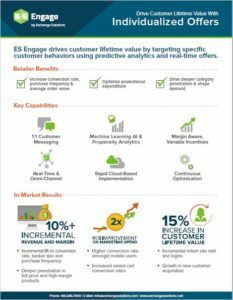 ES Engage is our cloud-based, individualized offers customer engagement product focused on driving incremental customer behavior and optimizing promotional spend, using 1:1, real-time technology, machine learning analytics and compelling customer experience. Built on a proprietary platform, our approach is unique and delivers quicker results, better ROI, and deeper customer engagement than traditional programs. It only incents customers for taking new and more desirable actions, saving precious marketing dollars. It capitalizes on opportunities when customers are already interacting and engaged, rather than presenting irrelevant offers based on historical, transactional or behavioral data. It provides a measurable return on investment unlike traditional loyalty, which is typically a cost center to the business. We’re so confident of this, that we offer a performance-based fee structure. It does not waste marketing dollars by incenting all customers with the same reward; it offers tailored incentives of different values depending on what the individual customer’s behavior is worth to the business. It works seamlessly across all channels to provide customers with cohesive experiences, rather than inconsistencies caused by siloed data and disparate systems.